Head coach, Commins Menapi, was ecstatic about the victory but said the team is now in competition mode and looking forward to the challenge that lies ahead of them. “We feel very happy about the win – we tested our players and implemented our game plan to good effect and that is a good sign. However, we know that it will be a bigger challenge in the competition but I think we should take the momentum of this result with us,” Menapi says. The Mamulas dominated the match against their more senior opponents even though they were far smaller and utilised their pace to good effect against the Fijians. New Zealand based, Kevin Obed, slotted the only goal of the match for the winner. Team manager, Leonard Paia, says that the win is important for the team following the trauma of the weekend. The Mamulas played seven friendly matches against local league clubs and select sides in Honiara before their departure for Fiji. Their results included wins against Marist, Malaita Kingz, S-League Select and losses against Solomon Warriors, KOSSA, Marist and S-League Select in return matches. 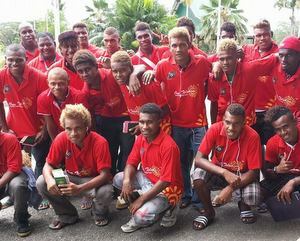 The Mamulas open the championship against Papua New Guinea when the OFC Under-20 Championship gets underway on Friday.